Examine leaves of apple and cherry, and fruit of peach/nectarine, for powdery mildew lesions. Apply a fungicide where necessary to prevent additional spread. Thin apples when they are 1/2-inch in diameter, and thin peaches now, or in the next few weeks (earlier is better). On apples, thin clusters to one apple and to six inches apart. Thin peaches to 4 to 6 inches apart. Codling moth treatment dates are coming up for northern Utah locations. See this post for spray options for backyard growers. Blister mites feed inside raised bumps on foliage. They do not harm the vigor of the plant. 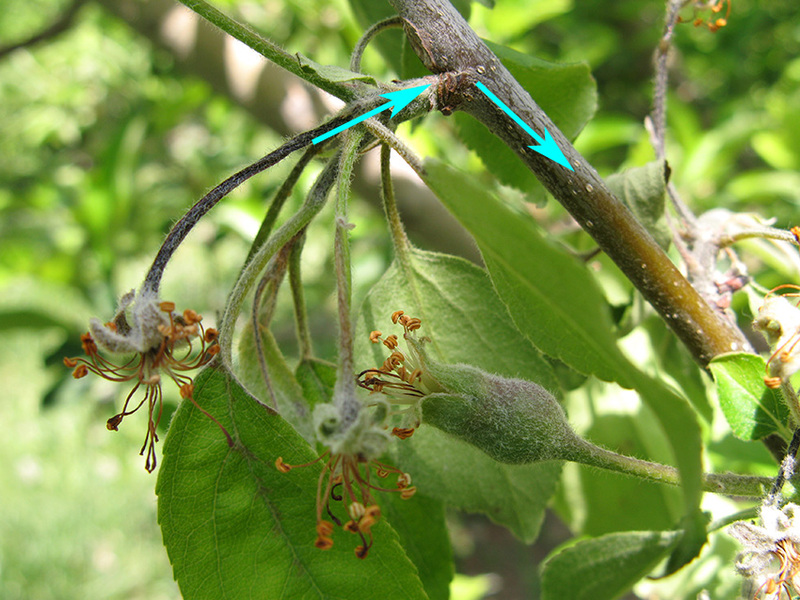 Appleleaf blister mites (left) start out green and turn brown in color. Pearleaf blister mites (right) turn a much darker brown later in the season. We have had reports of “spots” appearing on apple and pear leaves. These are actually tiny blisters, and inside each one are hundreds of microscopic mites called blister mites. The minute, 4-legged mites feed inside the blisters all summer. On apple leaves, the blisters age to brown, and on pear leaves, they age to a dark brown/black. After harvest, the mites leave the blisters and migrate to leaf buds to spend the winter. Note that there is nothing to do for treatment at this time of year, but an application after harvest and close to leaf drop will help. Materials to apply after harvest include Sevin (carbaryl), sulfur, or oil. This fire blight infection was caught 2 weeks after bloom. In this case, remove twice the length of the visible infection. Symptoms of fire blight infections will start to appear 2 to 3 weeks after full bloom. It is important to monitor your apple and pear trees every week. Look for wilted leaves, and fruit clusters that appear shriveled and brown. Prune out all diseased plant parts as they are found. This will not only prevent the infections from expanding into the tree, but will also reduce the source of bacteria in the area. This fire blight infection is about 3 to 4 weeks old. The bacteria has already entered the branch, so it should be pruned 12 inches below the visible canker. For infections that are caught early, remove twice the length of the visible symptoms. 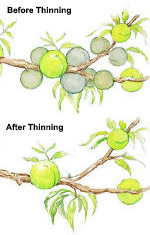 For infections that are caught late (that have expanded beyond the fruit cluster), it is important to make the pruning cut 10 to 12 inches beyond the visible symptoms. Prune in dry weather only. To be safe, wipe pruners with disinfecting wipes between cuts. If moisture is predicted after pruning, remove the debris rather than leaving it in the orchard. If conditions are hot and dry, it is OK to leave the debris on the ground. In spring, peach twig borer larvae seek out succulent shoots. Later in the summer, they feed within fruits. Peach twig borer affects peaches, nectarines, and apricots. 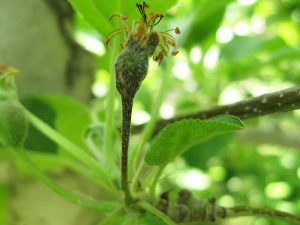 Unlike codling moth on apples, this pest is more sporadic in Utah, and some locations have a low enough population that does not need to be treated. Peach twig borer larvae prefer to feed inside leaf shoots. 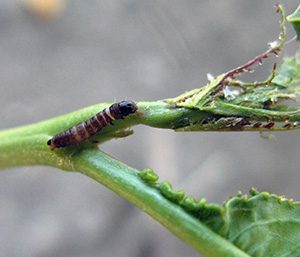 Later in the season, when twigs become hardened off and unpalatable, larvae enter fruit as the “second best option.” In short, the first generation bores into succulent twigs (hence, its name) while later generations move on to the ripening fruit. This treatment table shows when to start treating the first generation for a few southern Utah locations. You may need to apply insecticide regularly so that your tree is protected throughout each generation, or, if you have low pest pressure, you can get away with a single (or no) application for each generation (up to 2 well-timed sprays). Sprays for the first generation will protect shoots from being attacked while later sprays will protect fruit from being attacked. Commercial: It is time to hang mating disruption dispensers in northern Utah locations. Southern Utah locations that have treatment timing coming up can click here. Residential: Treatment options are the same as for codling moth. This winter was great for a lot of positive things: skiing, snowpack, and survival of flower buds. But with the good comes the bad, right? The snowpack and somewhat mild temperatures allowed for survival of many overwintering insects, including aphids. On peach, the aphids are green peach aphid, and they overwinter as eggs. They will spend the next few weeks feeding on the undersides of the foliage, and then migrate away to summer hosts (vegetable plants and weeds). Residential growers can use Ortho Flower, Fruit & Vegetable. This product is slightly systemic, so it will take care of the aphids on the undersides of the leaves. 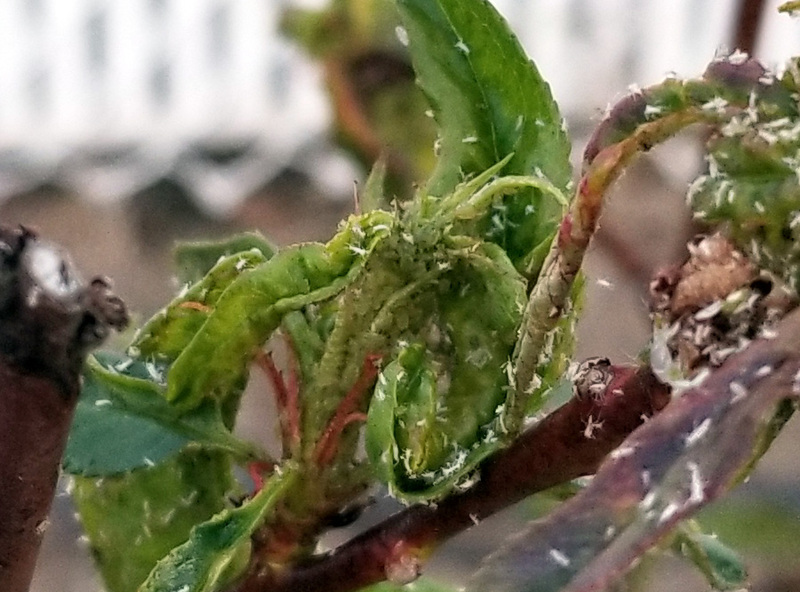 For organic, there is insecticidal soap, but the soap must come into contact with the aphids, and they are tucked tightly within the leaf curls. The weather conditions continue to be good for spread of the fungus that causes coryneum blight (intermittent rain). Commercial growers can find options by clicking here. The Group 3, 7, and 11 fungicides have some curative effects, and can still be effective if applied after a rain. Backyard growers can use Spectracide Immunox, or Captan. Ideally, the fungicide should be applied before a rain storm (and provides 2 weeks of protection). 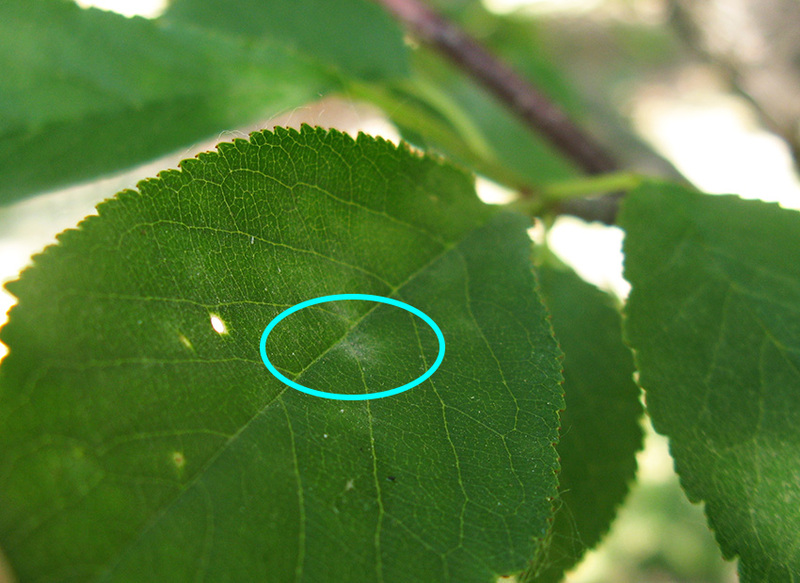 Monitor tart cherry leaves in the lowest part of the tree for powdery mildew. Cherry powdery mildew lesions may start to show up on tart cherries in the next few weeks. The fungus overwinters as resting spores in fallen leaves, on the orchard floor, or in bark crevices. 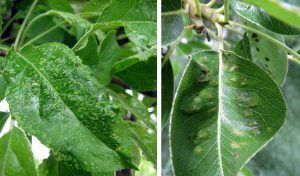 Infections on new leaves occurs when spring rains or summer irrigation increases the humidity under the trees, causing the resting spores to release and spread. This pathogen needs 90% humidity and temperatures between 50-78°F for infection to occur. Leaves, fruit, and fruit pedicels can all become infected. Monitor for the earliest infections on leaves near the trunk, and on the lowest, interior twigs (where humidity is highest). Sprays are recommended as soon as the first lesions are spotted, because prevention is the best management option for powdery mildew. Continue sprays at 7 to 14-day intervals until growth hardens off. Commercial growers can find options by clicking here. Treatment for western cherry fruit fly should start when the fruits in the sunniest locations turn a salmon-blush color on the yellow. The fruit in the middle of this picture is a good example. Treatment for western cherry fruit fly—the worms in the fruit—should begin as soon as cherries develop a salmon blush color. 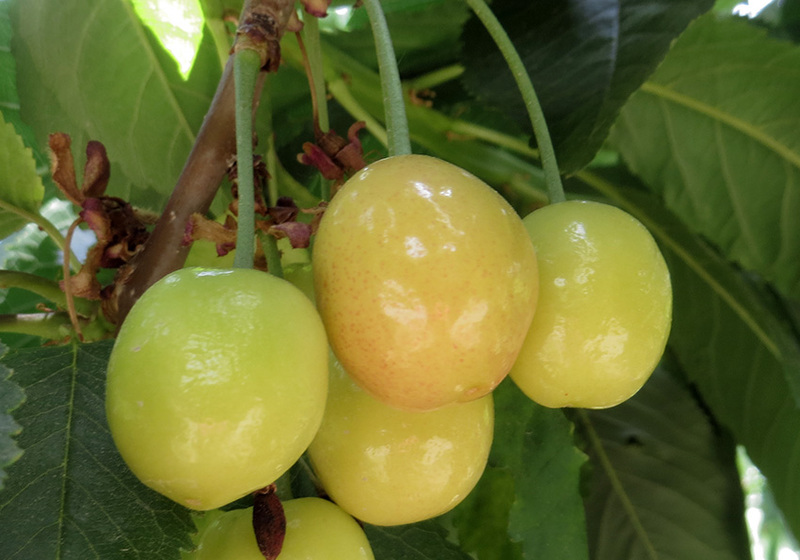 Tart cherries in most locations are still green, while sweets are coloring up. It is important to monitor your own trees for color change.